belonging to a Portland preservationist. 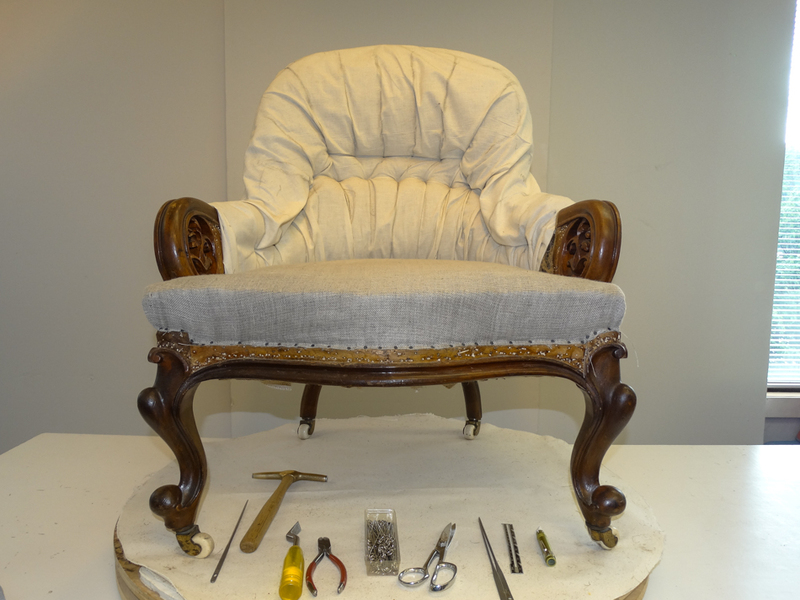 We’ll follow the chair in detail through excavation to the new show-cover. the regions where various upholsterings took place. MPFC takes more images during excavation that any other phase. to document while undoing of the piece. This excavation was performed in two parts, as you will see. This is the excavation of the seat. 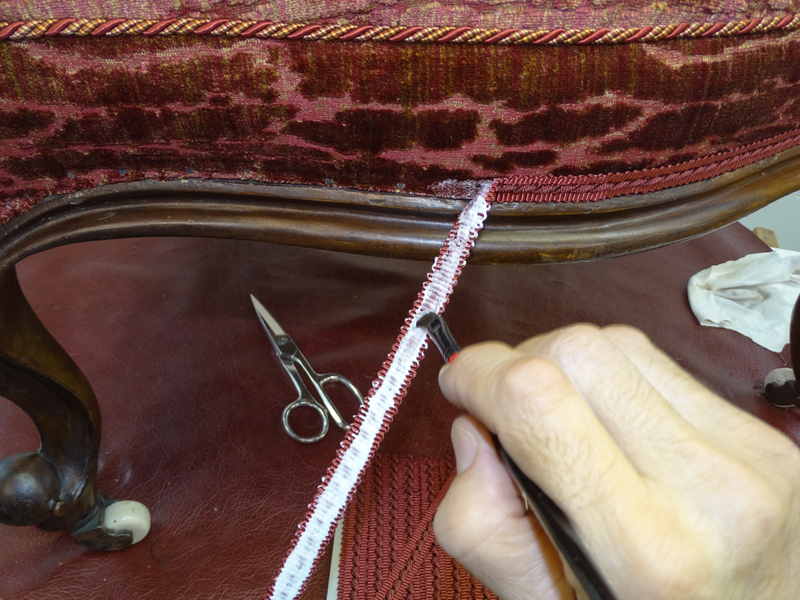 Mitchell’s note: Passementerie is the last item to be applied and the first to come off the chair, which is how it goes down through the layers. A bit like an archeological excavation. 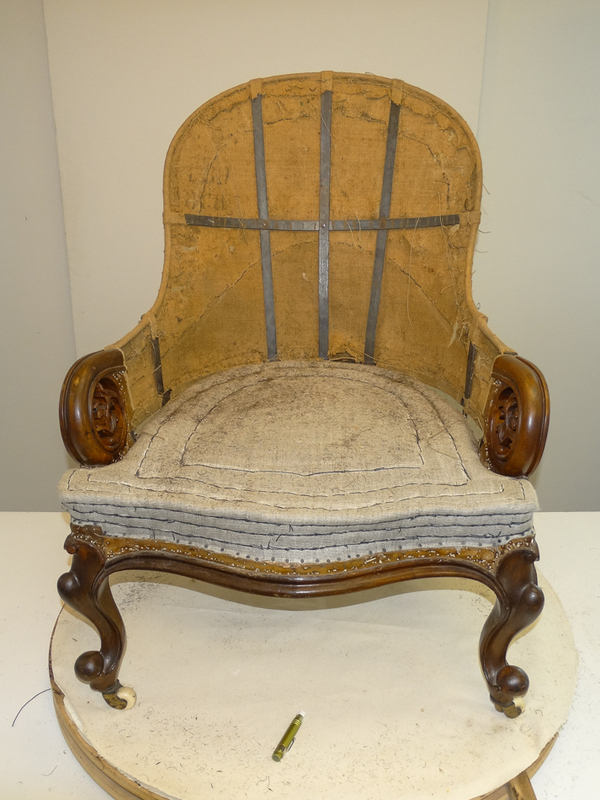 Conservators are interested in preserving the history of an object. To that end, we save samples and items as they are removed, noting their location. and/or we keep interesting samples for ourselves. You might not know what part of the story an item or mark informs. and may need to tell the client if changes in the estimate are necessary. sold secondhand with this showcover, including who performed the fumigation. 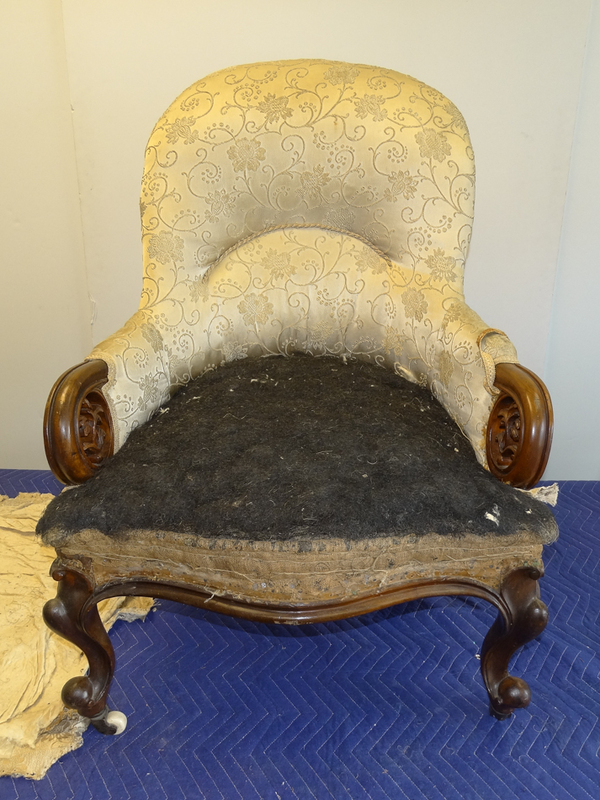 the fumigation laws for secondhand upholstered item sales. What appear to be original ceramic wheels are in good condition. The showcover was removed from the seat. 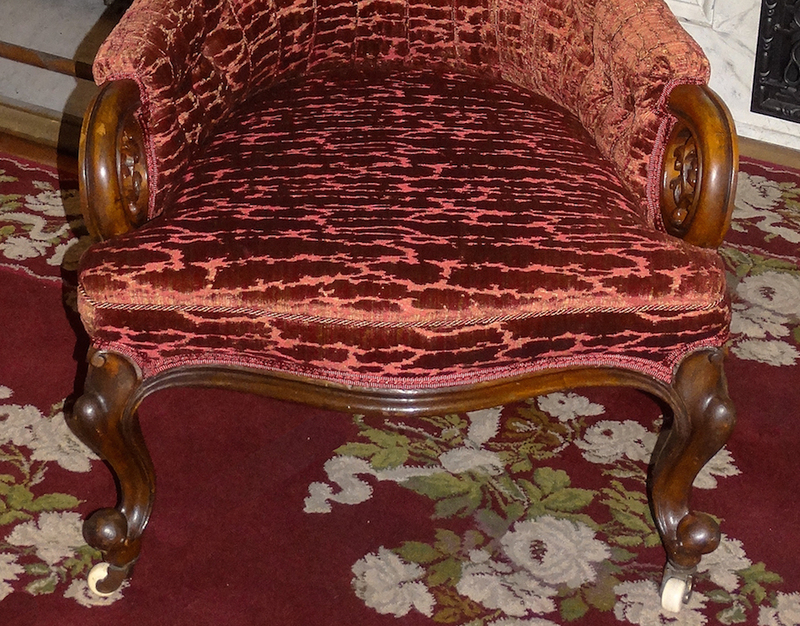 second generation upholstery, suggesting it took place in Europe. The wadding is no longer obtainable in the states. He also got his first glimpse of the bottom of the metal back frame. Samples of passementerie and fabric are kept. We found a missing decorative scroll to be replicated. frame a symmetrical view, and Mitchell looked at the frame with new eyes. The back and two legs are badly twisted. The chair is quite sturdy, and not in danger of tipping or breaking. identified as a green velvet. Usually we see bits of earlier fabrics; this time only one. 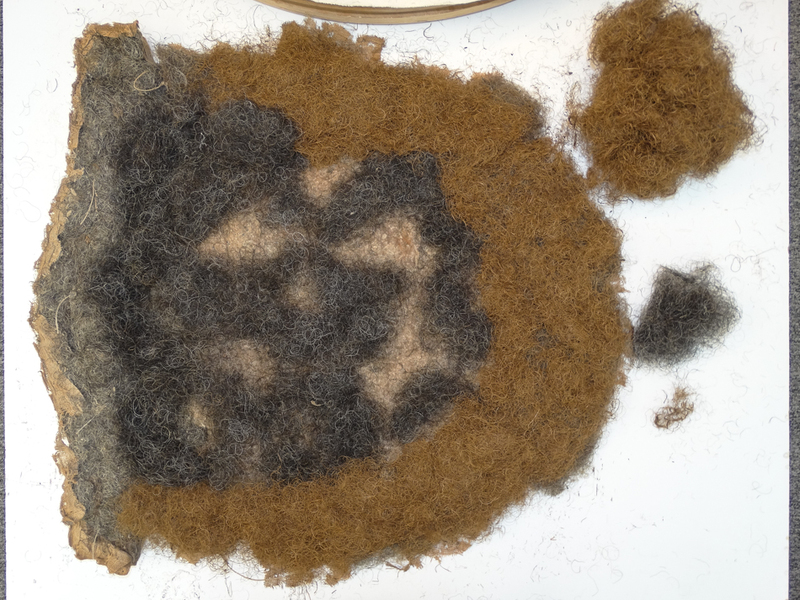 Top layer of horsehair — new horsehair, not original. 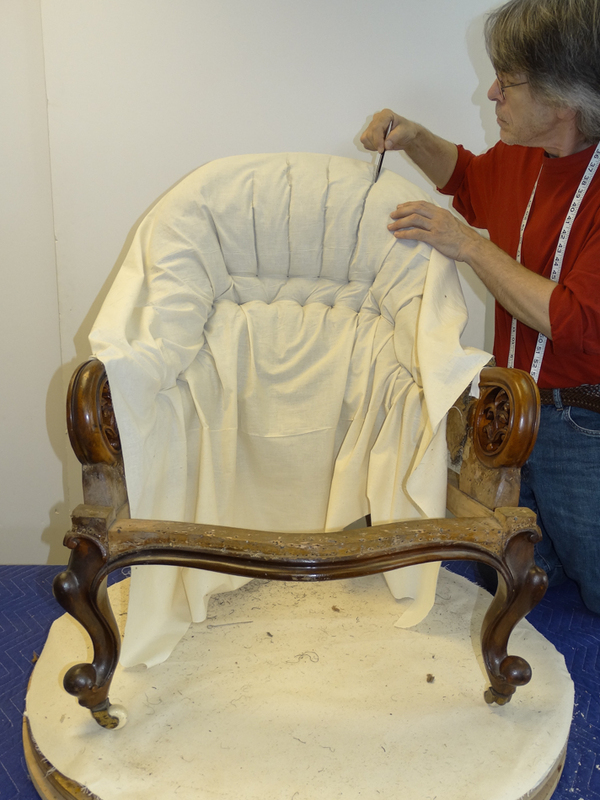 Mitchell began to remove layers of the seat; Kate documented each step. two layers of cotton toppers, and a horsehair pad. Mitchell surmises the chair had between one to three showcovers. Good fabric, proper foundations, and proper care can make a show cover last a long time. All materials are cleaned and reused unless there are preventative issues. The seat is partially excavated. Mitchell encounters an original hair topper, properly lashed to the seat deck. He noted the lashing pattern, then cut and lifted it. This is protocol on each layer. 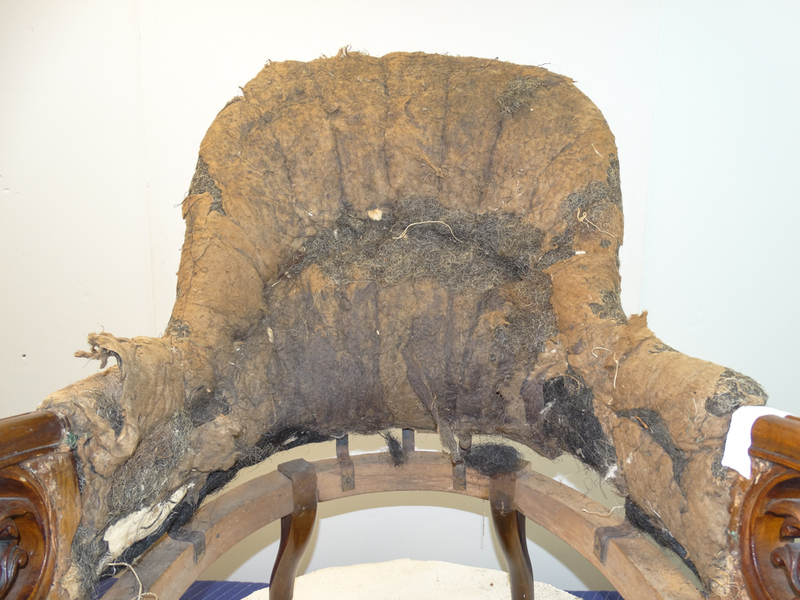 The seat deck hessian was exposed; after vacuuming he inspected it. various types of dust and debris which can mess with your lungs! Lashing patterns noted, and details of the fit. 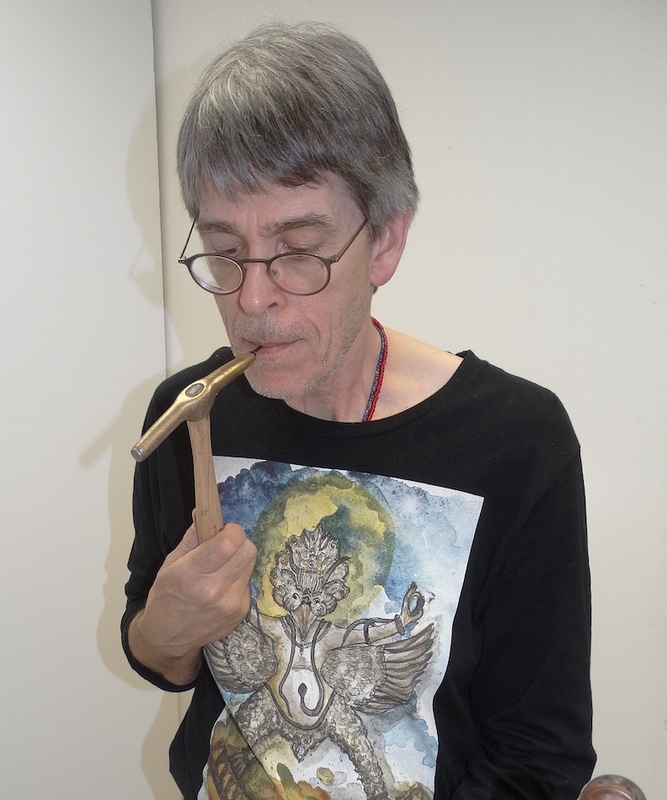 We loosened the inside arms to inspect the carvings and connections. or damage when the frame maker does not include tacking foundations which allow for tacking without encroaching into decorative elements. Mitchell will change the frame slightly to include a tacking block to preserve the carving from future mistakes. We will repair the lovely carving. There was damage to the connection between the carving and the metal frame on both arms, also to be repaired. This may be a wear-and-tear issue, or possible a design issue. We discussed this issue (and all other issues) with our client as we found them. 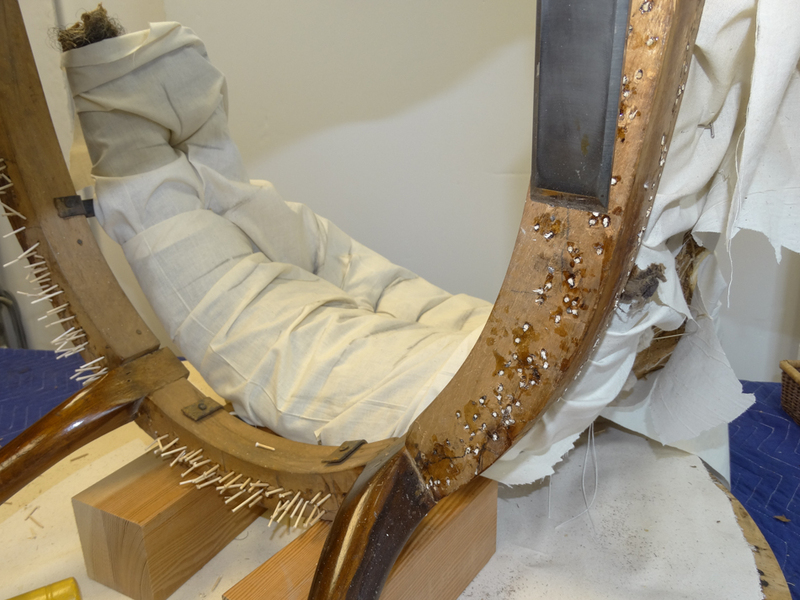 The original fiber seat pod came off, to be cleaned and conserved. spring deck and seat deck to conform to the stresses. Spring deck burlap was removed, and Mitchell inspects the original springs, including the dirt. MPFC finds odd bits sometimes, including coins. The debris was vacuumed. The springs are heavy rolled steel, which we will clean and conserve. Mitchell noted the tie pattern before removal, but did not cut the ties yet. He usually does not cut ties until the last moment necessary. as he lifted the tacks holding the ties to the frame. Two were applied in order to save the springs. 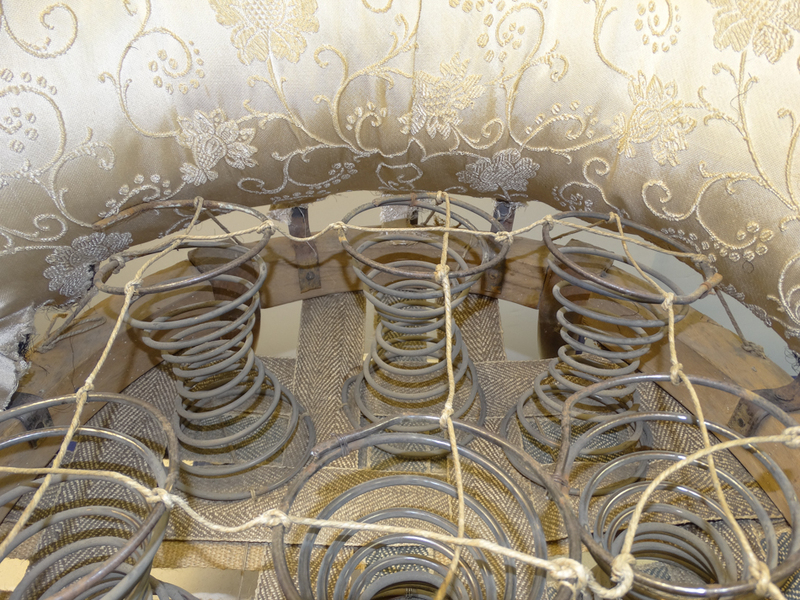 This second layer (top) is the creamy webbing above, not lashed to the springs below. was the darker herringbone webbing in a criss-cross pattern. It was also not lashed in any manner to the springs, very odd. As Mitchell removed webbing, he continued to note holes and tack positions. 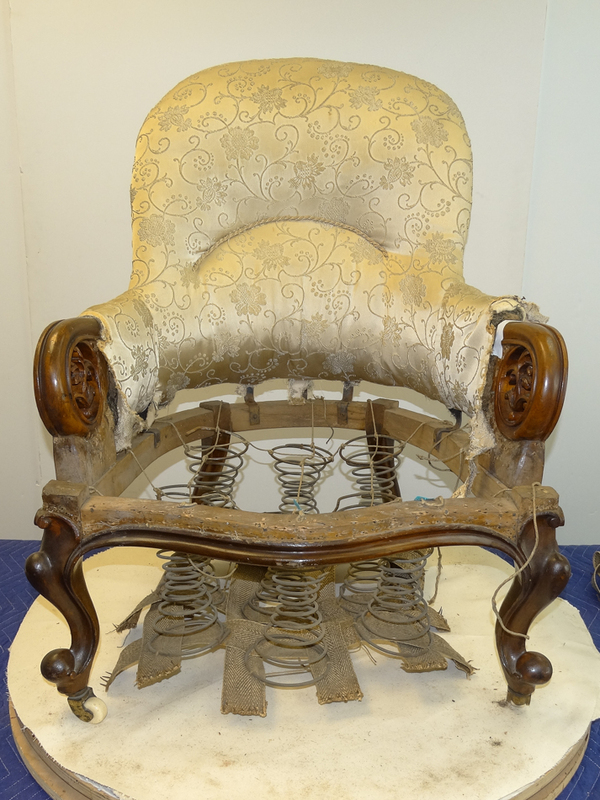 They tell the story of the number of times the chair has been upholstered and in what manner. Mitchell was down to the original webbing, properly woven in a basketweave pattern. 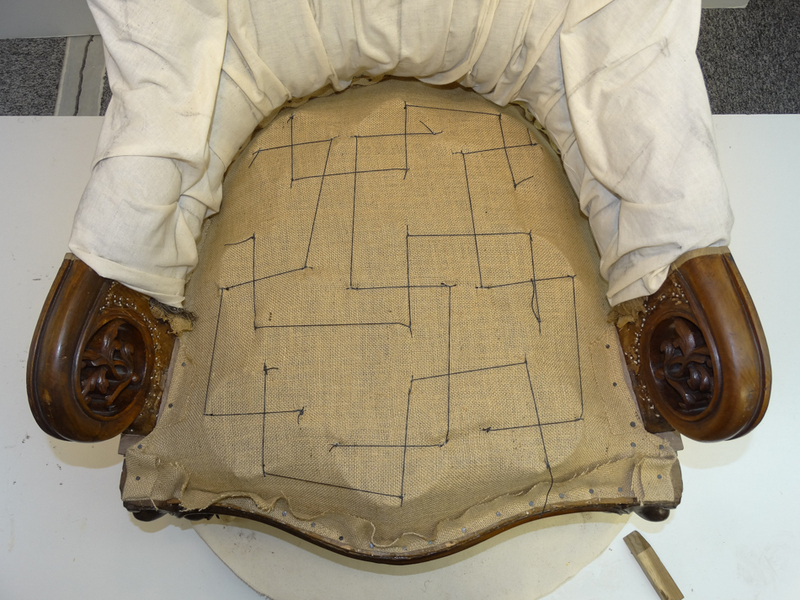 gave him the clues as to the number and nature of the upholsterings. 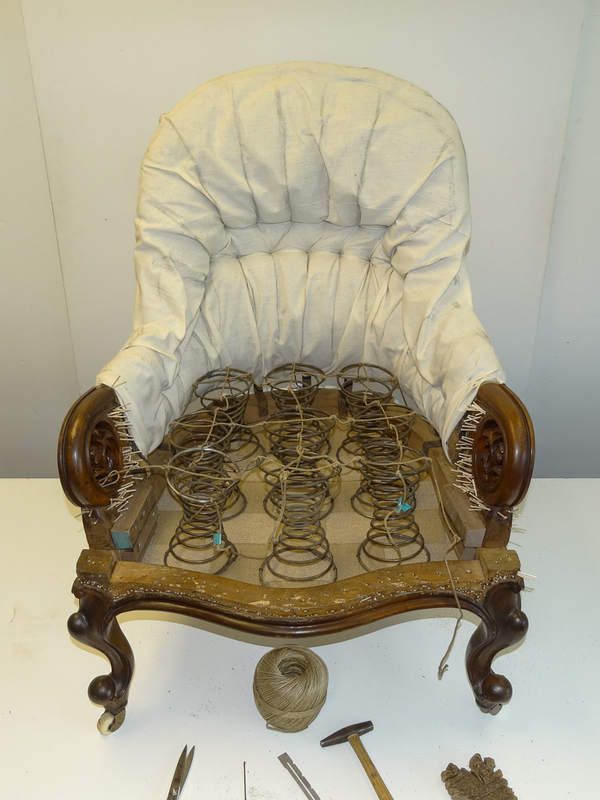 and the person who performed the second upholstering did not retie the springs. European Beech (frame) was not commonly imported in the states. and even into the colonies, which offers other clues. but found in England and Europe. and the excessive rusting of tacks and metal objects were consistent with exposure to very high humidity, such as might be found where there is good rainfall and relatively high temperatures, and possibly salty air. This information, coupled with what little provenance was available, led Mitchell to surmise the piece may have lived in France (where it began life) but also lived in either the tropics or a city like New York. 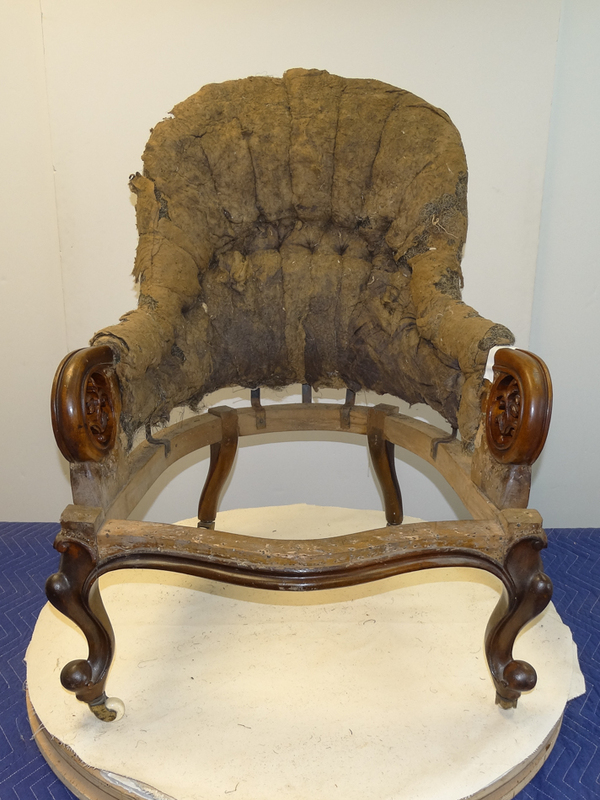 The fact that it is a planter’s chair, with carvings reflecting plants that grow in tropical regions (sugarcane or tobacco) makes him lean toward Latin American or the Caribbean. and we move to the inside back, next post! Mitchell previously loosened the inside arms around the carvings. and after noting the stitching pattern used, cut the ties to the showcover. was removed exposing the original buildup on the arms. which began to reveal the original styling beneath. The showcover dropped, and he inspected the inside back for the first time. one clue now is the difference in the colors of the hair used. 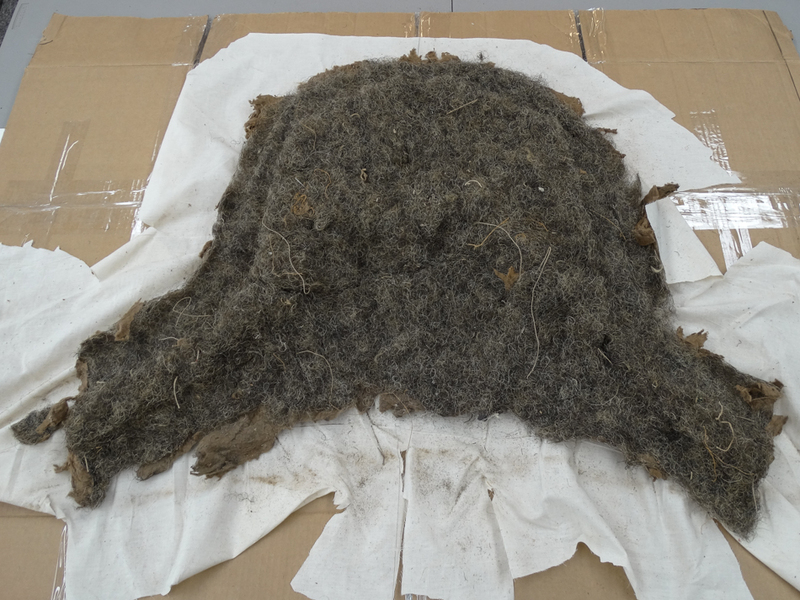 The second generation cotton batting and horsehair was removed, labeled, and will be cleaned and reused as appropriate for the conservation of the inside back. what was about to be revealed: a tufted back! 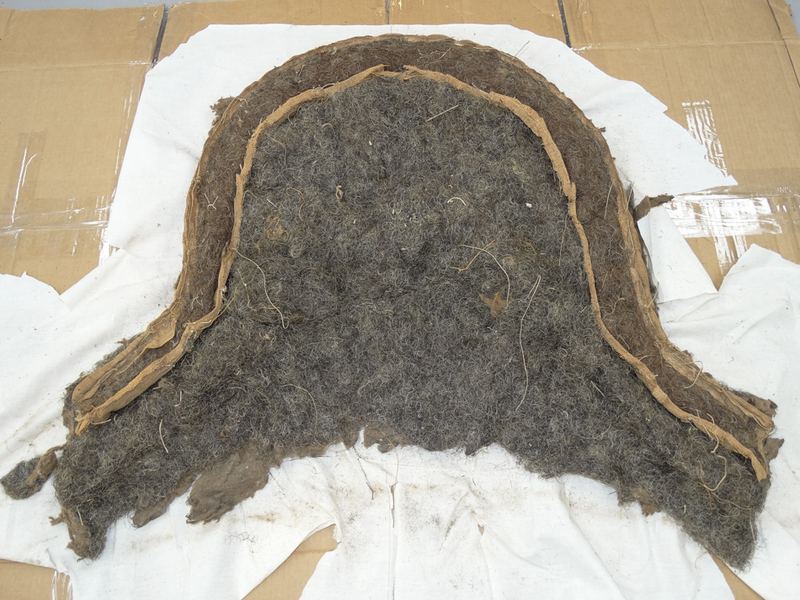 This is the original inside back, with the tufted buildup exposed. around the buttons instead of cotton. 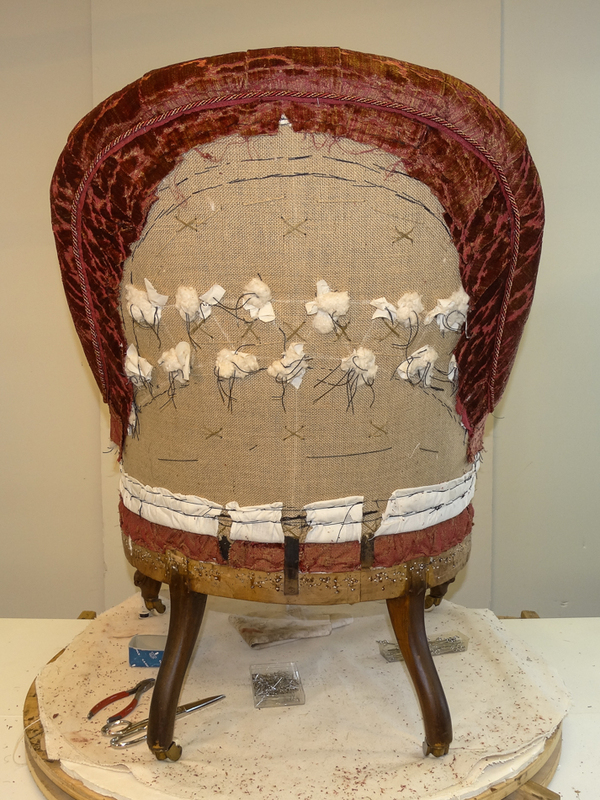 The top horsehair removed, the final pattern for the buttons of the tufting were exposed. but it was actually a topper of lint “flocking”. late 19th century in stuffing seat squabs, especially in England and France. onto second stuffing surfaces to act as a soft malleable batting. stretched across the steel hoop and lashed along the edges. 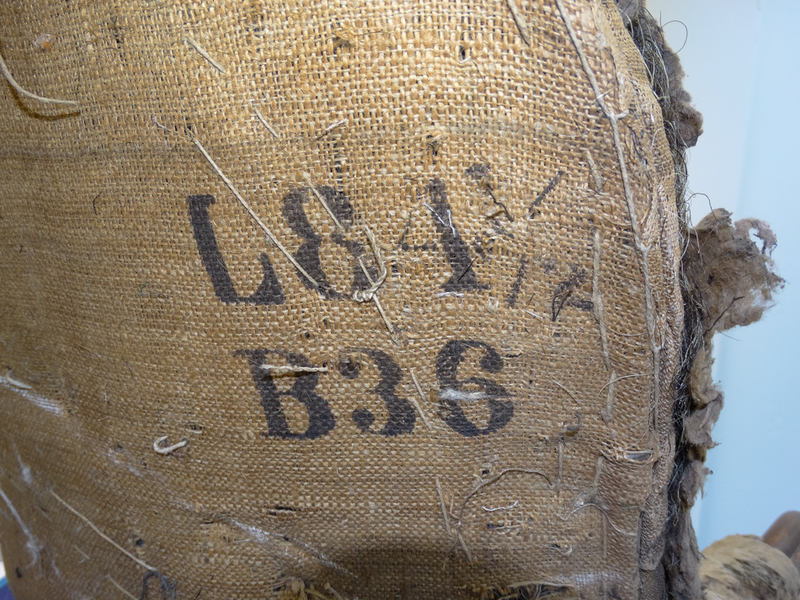 The stamped letters are likely to be from the mill for the hessian burlap. 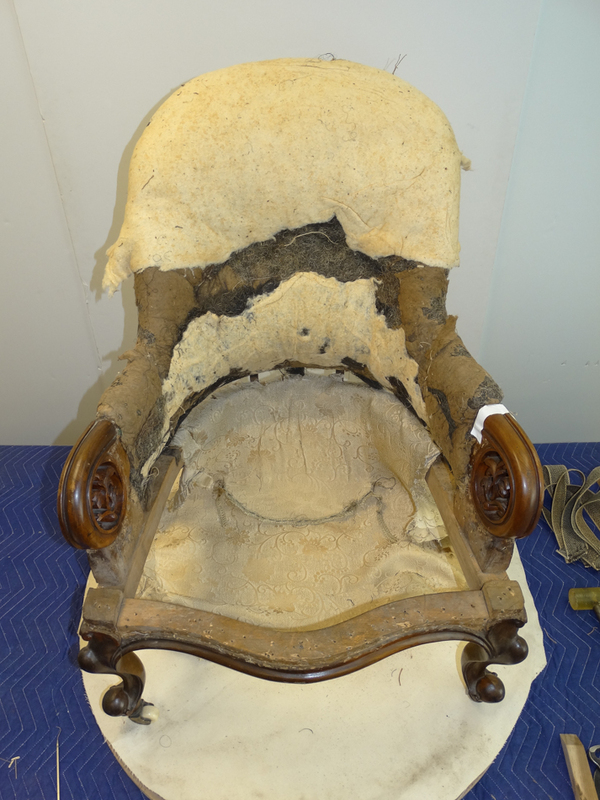 in this case, after the seat buildup he will turn to the excavation of the inside back. We move to the frame conservation! The frame’s joinery had issues in two places and one was a surprise. 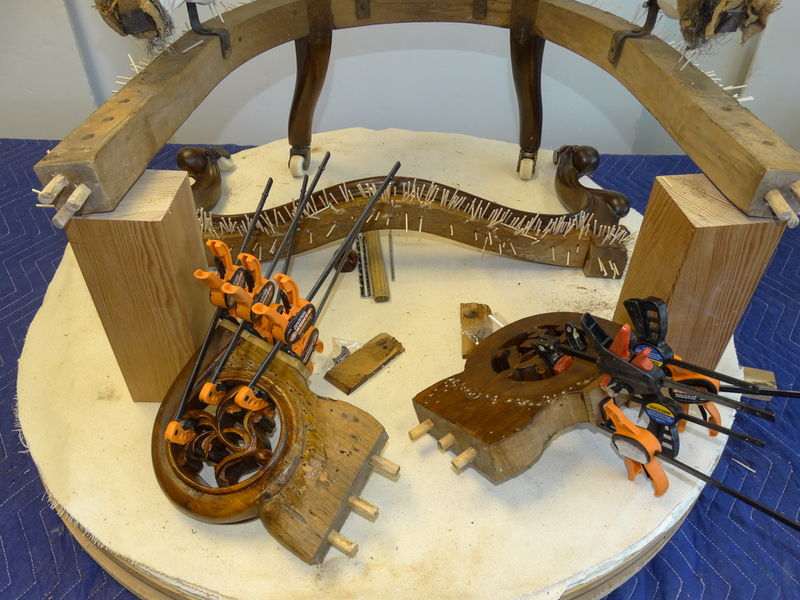 mortice and tenon, readying it for reparation. 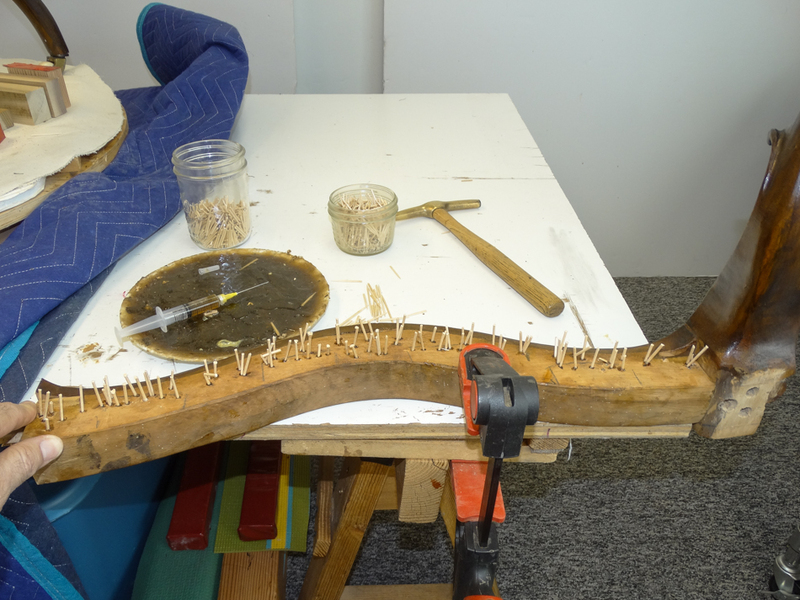 the picks drop easily into the abandoned tack holes filled with hide glue. as they will not impart structural integrity. They will not hold tacks. and putties will thwart future conservation efforts into perpetuity. Modestly bruised or worn tenons, where gaps could effect efficacy of the reglued joints, were laminated with thin veneers made from similar wood species prior to regluing of joint. 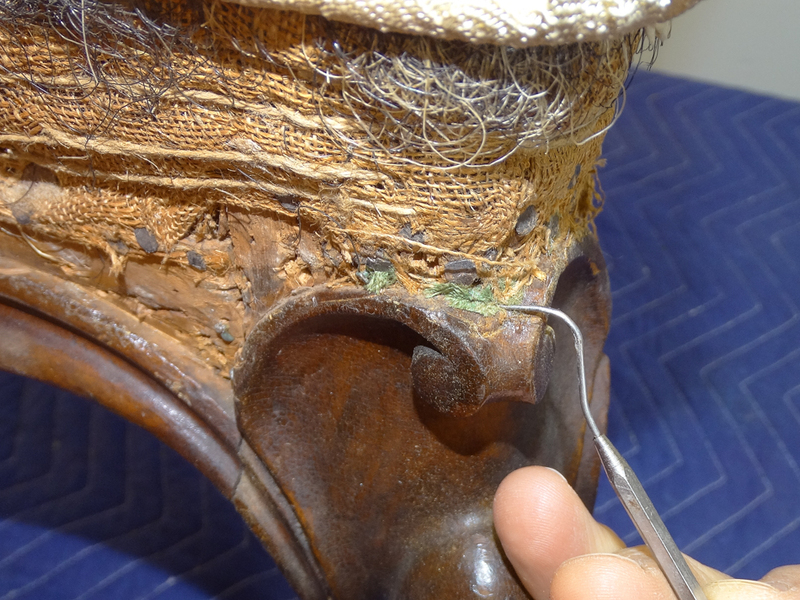 Warm hide glue was applied to cleaned conserved parts, and clamped to cure. Tack holes in the carved decorative arms were also conserved. and the flatter plain surface facing the outside arm of the chair. At first the visual effect seemed confusing (makers have been known to make mistakes) but as Mitchell ventured further into the project he realized it was not a mistake. Mitchell was surprised to uncover the decorative arm to metal frame connection, . fragmented into multiple disintegrating bits. after assessment, during conservation processes. It is advised to work with your clients about payment, keeping clients informed as adjustments in costs are resolved. the connection fashioned and the piece assembled. 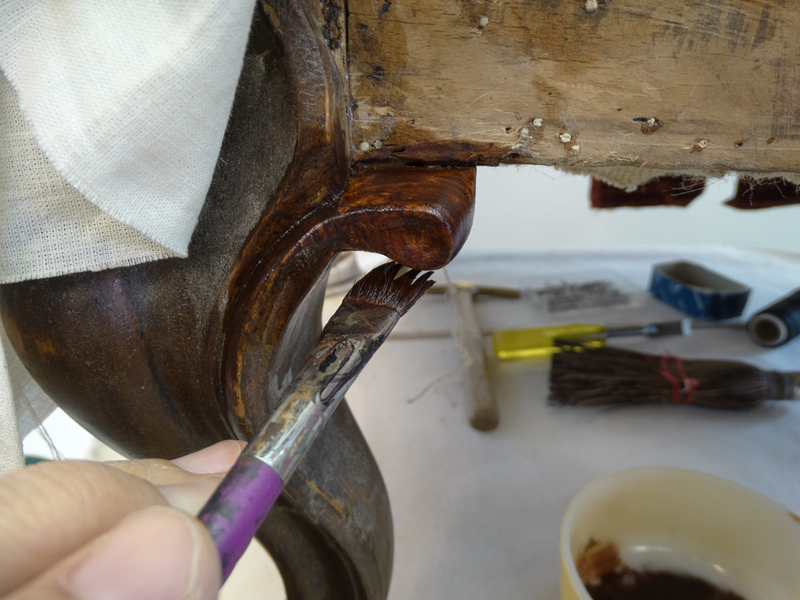 A small bit of carved decorative wood was loose and glued with warm hide glue. 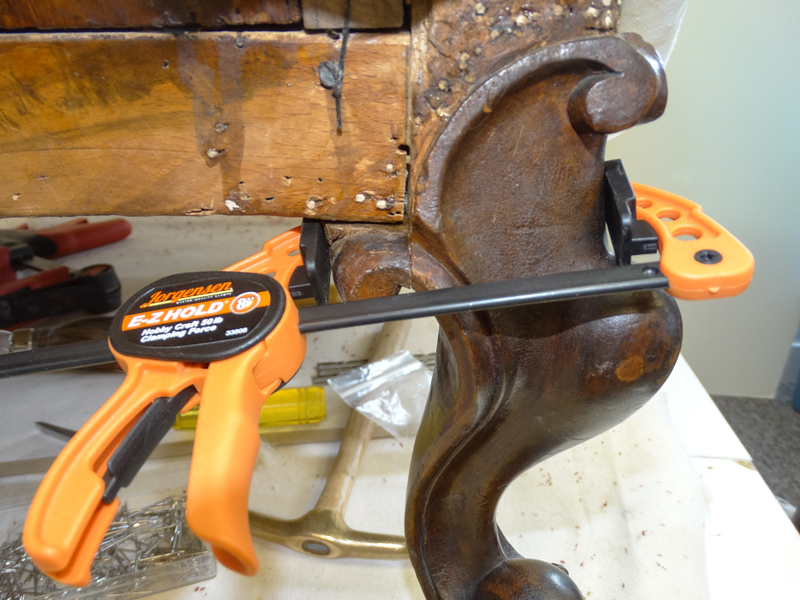 All the glue used in the reconstruction was warm hide glue, clamped to cure. of good quality without bulking agents or chemical additives! and only make fish or rabbit hide glue when necessary. 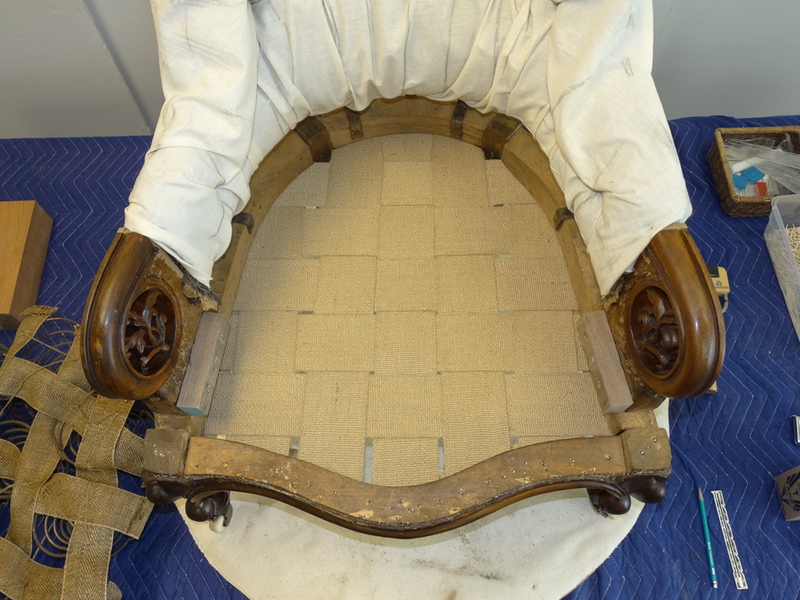 The rest of the chair frame holes were conserved. with warm hide glue, and clamped to cure. Picks were leveled using a chisel. 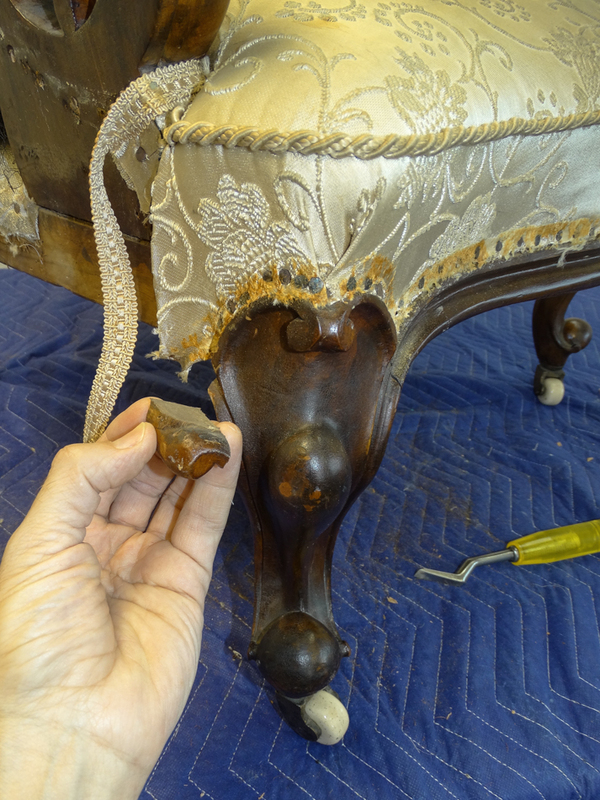 The repaired persimmon-wood carved arm front tenons were brushed with warm hide glue and returned to original positions in the cleaned, prepped seat side rail mortice. securing screw and hoop to the backside of the decorative arm front. 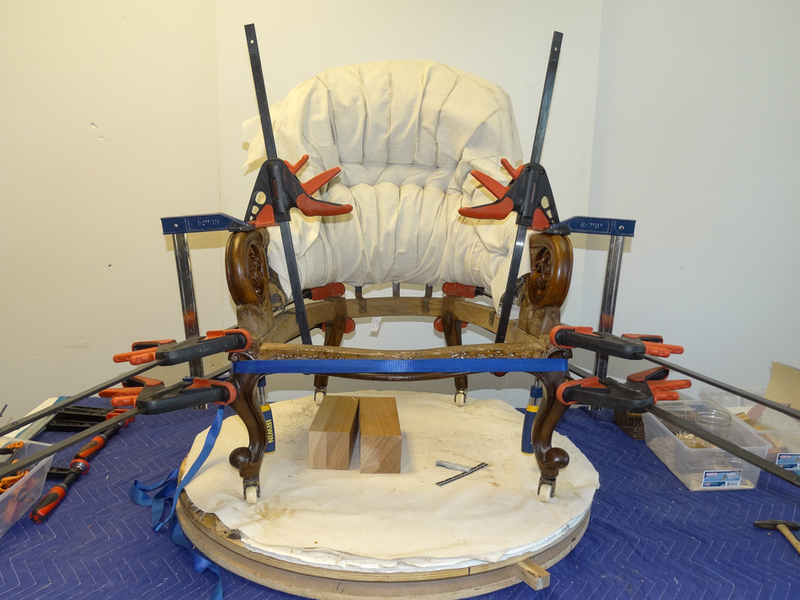 Finally, the assembled and glued chair was leveled and clamped to cure for 48 hours. toe-nailed into the frame inappropriately, which caused most of the damage. This type of retrofit is a preservation measure. around the decorative arm foundation resulting in recessed contours around the arm which are embellished with the decorative show cover and woven braids. occlusions using Gamblin’s Gamsol (Odorless Mineral Spirits). on the left-facing leg and loose on this leg. 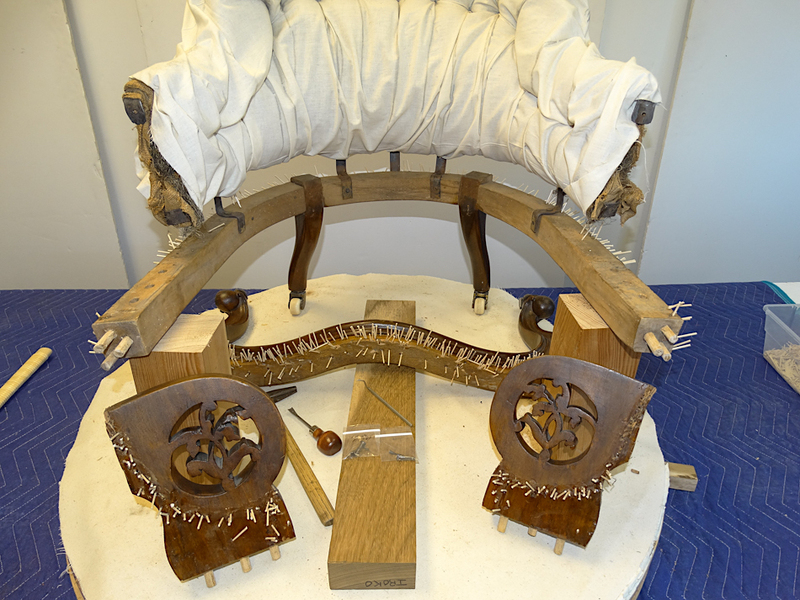 joined to the leg proper then glued and clamped to cure. 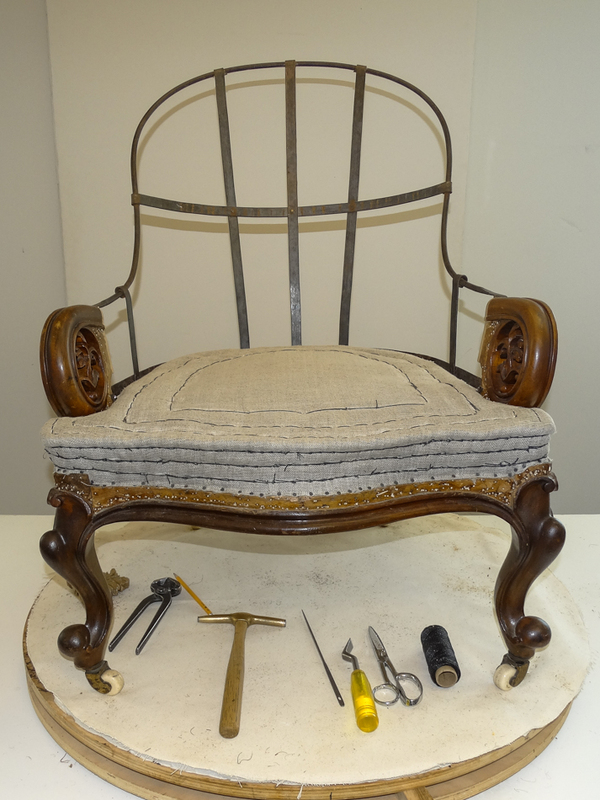 The chair was ready for finish conservation. The “stain” was created by dissolving powdered pigment in isopropyl alcohol. Mitchell applied our stain to cure until completely dry. After, a topcoat of blonde shellac was applied to fix the infill color in place. multiple applications and viscosities until burnish-able. MPFC created this wax by infusing bee and carnauba wax with finely powdered pigment with the addition of “drying” oils to polymerize the mixture and act as a fixative. warm, a slight sheen, and if you looked closely, evidence of the wear of time. The frame is conserved and restored! The chair was turned over. 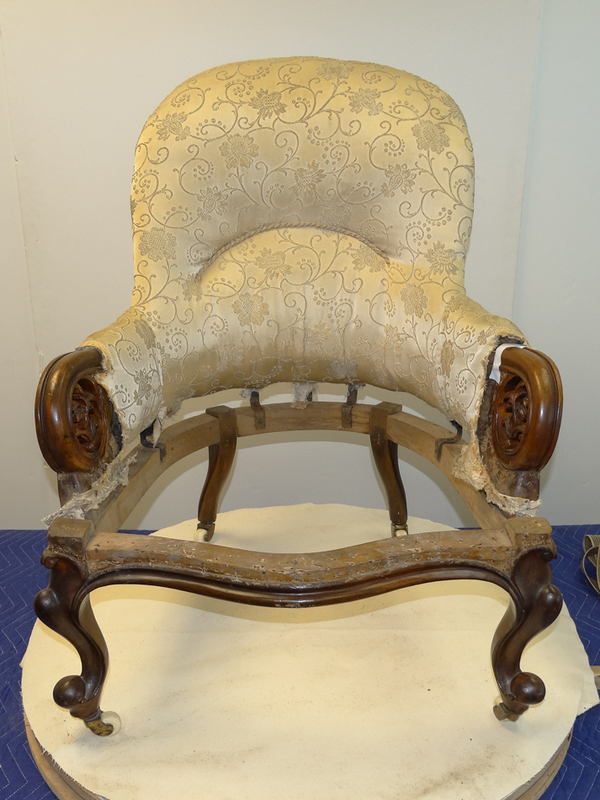 Upholstery conservation on the conserved frame begins underneath. same placement, using similar webbing to the original. the more I considered it, the more I realized this was likely NOT the original webbing. Tack hole patterns suggest a tightly woven webbing of greater width, also European. In this, the oldest generation found, note it is likely numerous courses are missing. the spring at center (the spring could fall through, see third image). It may have been rewebbed from underneath, as the springs were also not lashed to the webbing. 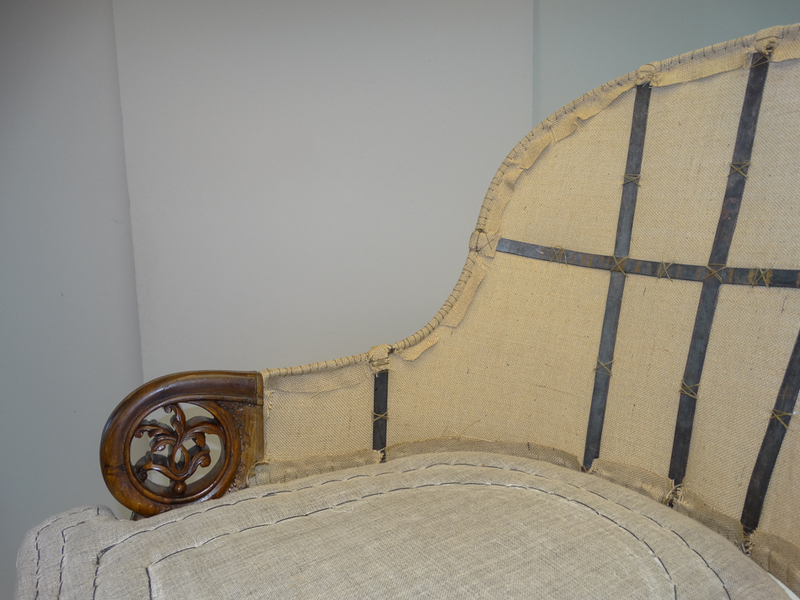 between courses of webbing, in keeping with the French style of upholstering. was made in France or was created in the French style. We keep samples of original show covers, burlaps, muslins, and webbings for our clients. Webbing completed; Chair turned right-side up! 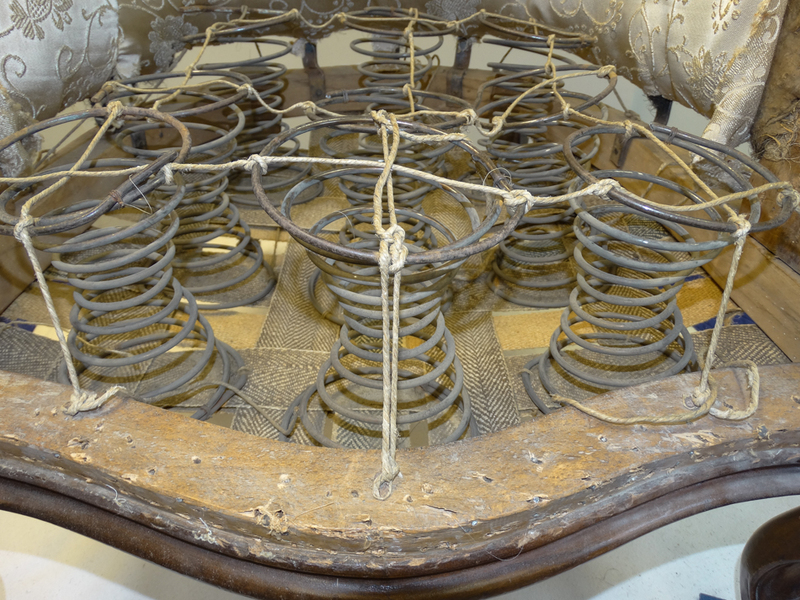 Cleaned springs were placed, still tied, into position. block was needed underneath the block placed in earlier (see previous post). A double blocking system was the totality of the addition on both sides. and places them properly into position. in online classes in the near future. The four-way double tie was completed. user dropping deeply into the seat with a low center of gravity, ergo, the four-way tie. So much can be learned by paying close attention to details during excavation! 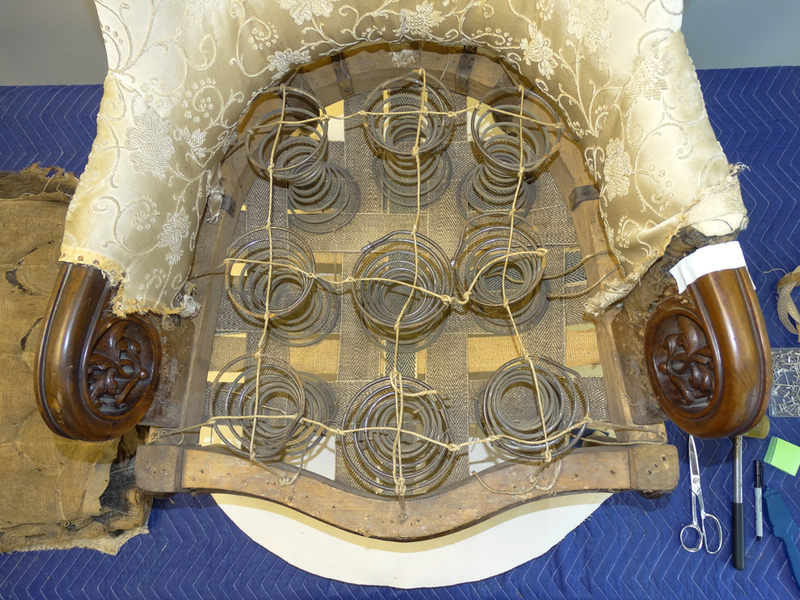 The hessian was tied to the springs in a four-point pattern. and wonders about the connection. The Holbein is shown in the buildup, and will be taught in our online classes. and selectively teased and made ready for installation. and the pod was placed onto the Spring Deck. 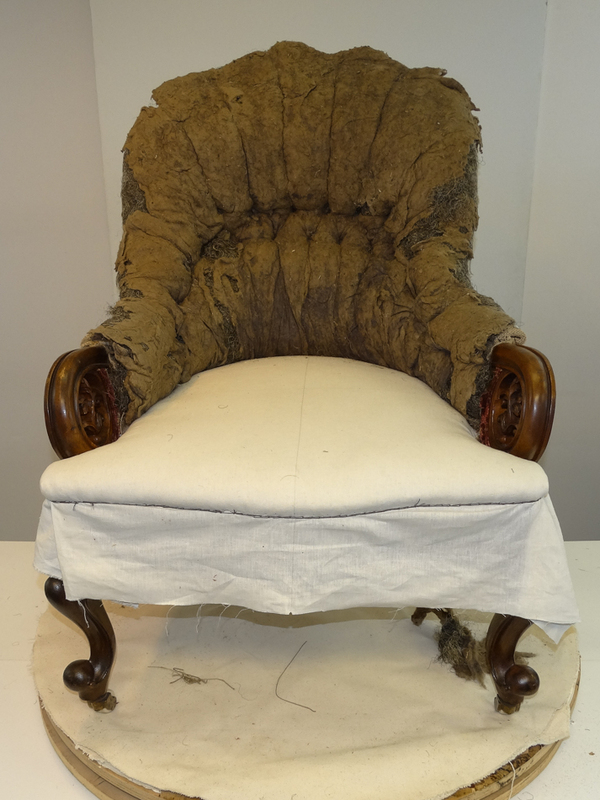 covered the original hessian, and was tacked into place. Both the historical pod and the new topper were used. The fiber pod was marked, readied for lashing into place using 12 ply waxed linen twine. establishing a center of gravity for a comfortable sit. The third front row of stitching performs double duty in this instance. the building blocks for the fiber pod’s ultimate structure and longevity. firm and shapely, and allows the fiber pod to last decades under consistent use. we move to the inside back excavation! from the inside back (image #1, discussed why here). without the seat built-up) and horsehair, above. a good deal of the color is the actual color of this flocking, though it was also dirty. Both were cleaned and teased as necessary, and laid face down. over the heavy hessian foundational membrane. then the edgeroll was carefully removed. from the steel hoop frame after anchoring stitches were cut. refer to them to replicate the original stitch patterning as necessary. the original inside back in the order removed. removed, patterned, cleaned and readied for reapplication. It was also placed atop the other inside back pieces in the order removed. 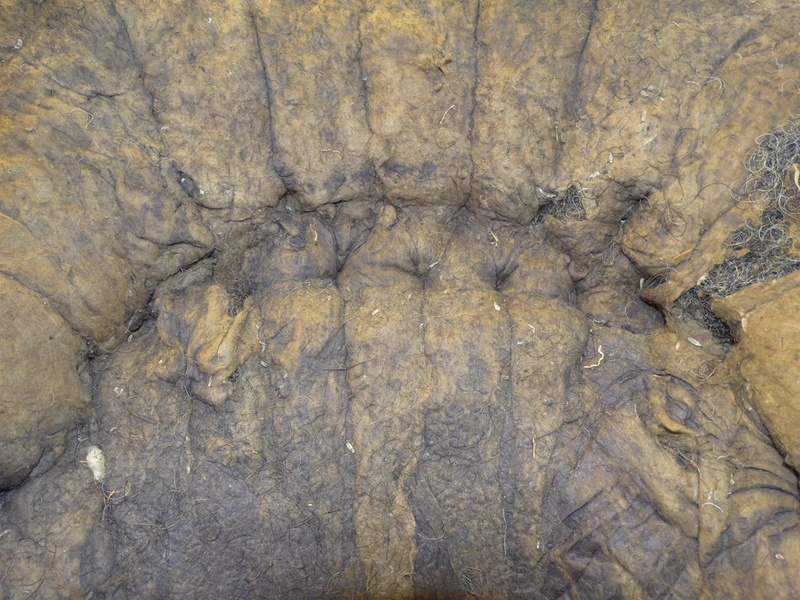 original hessian foundational membrane, above. Finally the original hessian foundational membrane was removed, and the steel hoop (frame) was fully exposed. Notice the nice contour to the seat pod at the rear. From an upholstering engineering perspective, the roll around the seat rear and inside arms play an important function relative to a semi-firm barrier between the inside arm and inside back, keeping a tight fit between those elements. The roll also acts semi-independently from the central portion of the pod, where the primary center of gravity exists, allowing the sitter to drop into the springs without collapsing the seal between the lumbar area of the inside back and the seat. 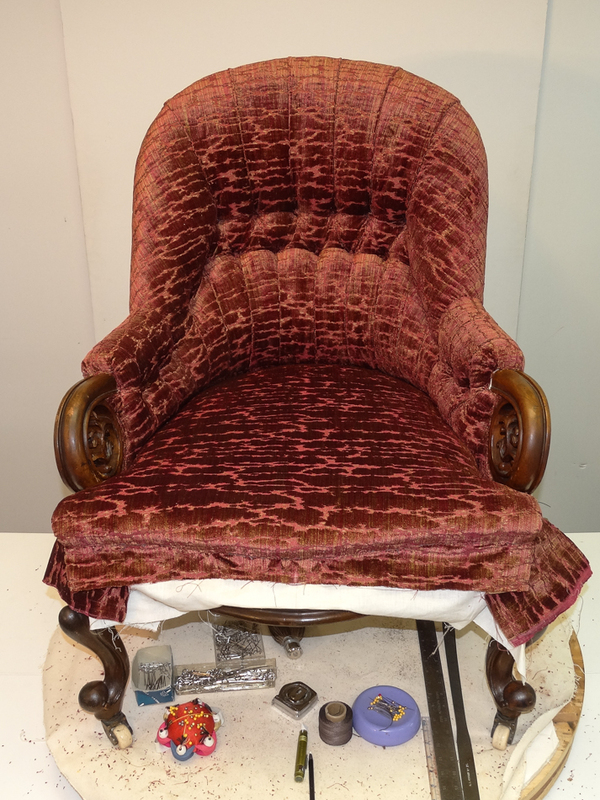 It is also easy to see the geometric flavor of the Art Nouveau style, though the chair precedes the production of that style by several decades. The back is fully excavated! The inside back completely excavated. a product of repeated sideways sitting by an inhabitant. was “off” when it was actually the tilt of the back’s steel hoop. original inside back and arm foundational membrane. to the hessian in order to insure the best positioning of the woven medium. heavy 12-ply linen twine in a locking blanket stitch. ensure the hessian did not move over time. The seat and back now will be built together. reverse order of excavation; what came off last went on first. to replace original hairs broken over many years of use. A new cotton topper was placed upon the hair. making the surface ready for the new showcover. 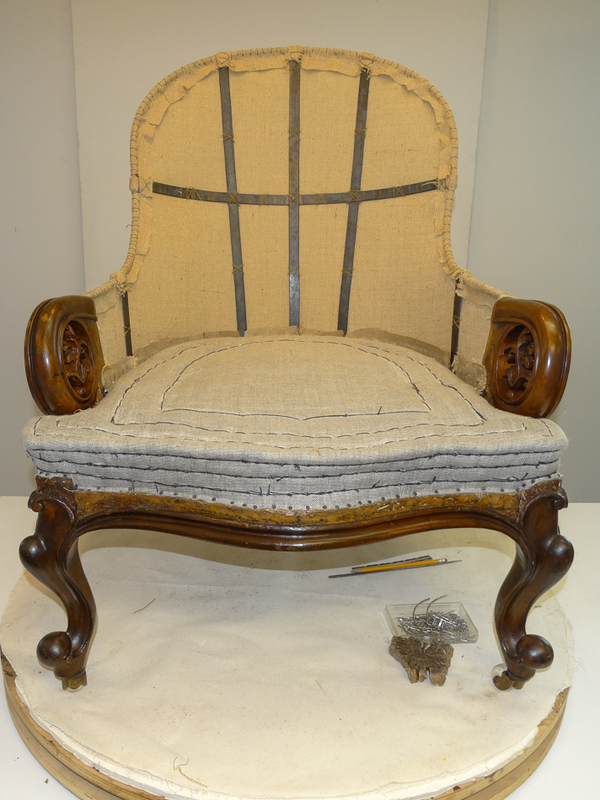 covered with 9oz open weave hessian. and the inside back and arm base. loosely stitched with linen twine awaiting amendment. in order to add resilience to the historic roll. they break, powder, and sift through their encasements. were fully lashed using linen twine. running down to the hair pod. (cleaned and teased), was set into the conserved form. so the evidence of period materials would be available for future generations. The second stuffings were lashed into place using linen twine. easily seen on the outside back of the foundational hessian. 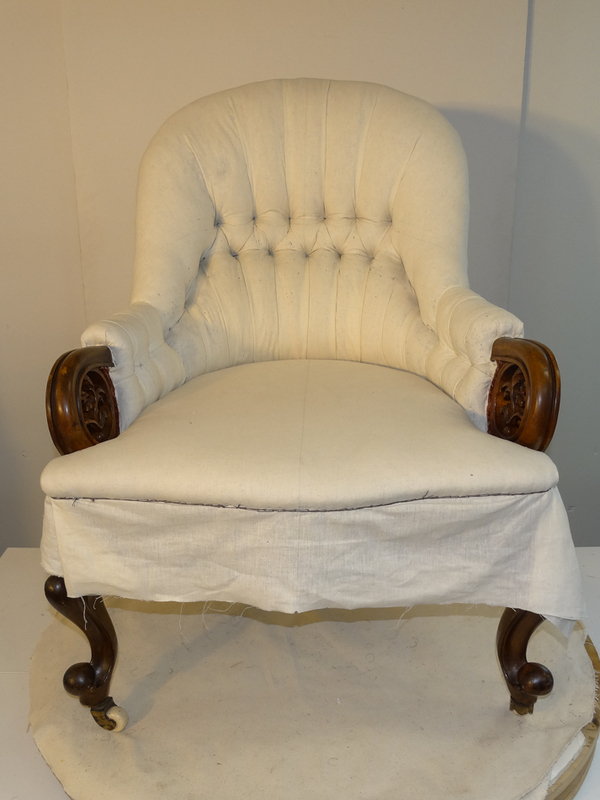 Tufting began using a 5oz finely woven hemp hessian. The patterns taken earlier were applied and adjusted to the conserved form. in which our client was familiar, but rather the historic form. but before Mitchell buttoned the tufts. to the back foundational membrane. and a running stitch installed to secure. was knotted to the foundational membrane. and the buttons continue onto the inside arms. The gully continued to be defined as a decorative element. defining the final arm top and final button placement. after the showcover and buttoning is complete on the inside back and arms. readied for the decorative showcover. is completed on the inside back and arms. and so was a good choice for historic reasons. on a tightly woven cotton base with a dense thread count. 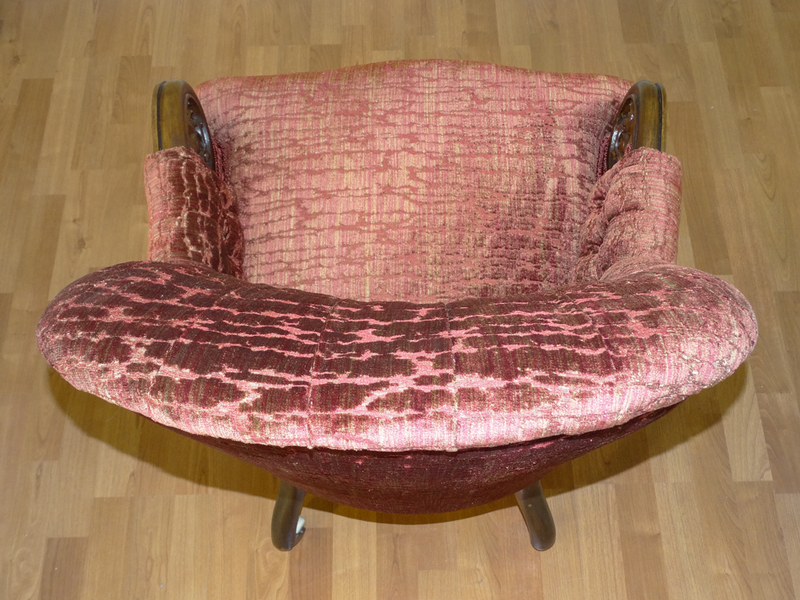 The gold flecks cause a shimmering effect as you move around the chair. to play against the gold flecks in the velvet. a yardage verification was performed, and the entire roll checked for flaws. from the company and/or the fabric returned for replacement. Patterns were created, which is a lesson onto itself. cuts the circles for the button, then molds it onto the metal forms. These machines are indispensable to a serious upholstery studio. a thin layer of felted organic 100% staple cotton. protecting the showcover from premature wear. softens the surfaces creating a sumptuous look and feel. A very long button needle is used to place the location of the button through many layers; the button threads are in the needle in all of the images above. Once the needle is placed it is slowly pulled through and tied (images 5 & 6). Cotton is used to keep the button from ripping through the foundational cloth. the folds are placed, as they rarely “fall”into a pleasing folding pattern. 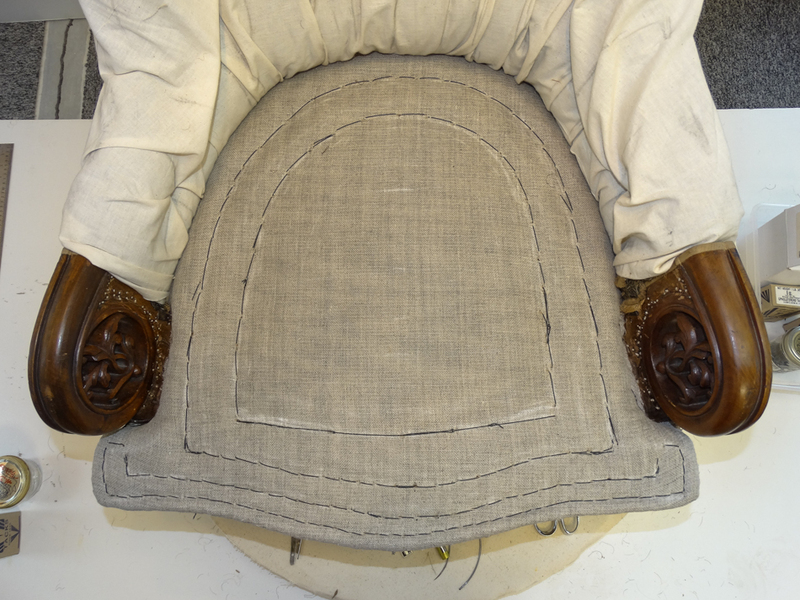 Buttons were installed; now the entire chair can be closed up. in order to prevent slipping and easing of the area where the inside arm begins. arm-top squares creating a comfortable support for the forearms? Pausing to show the entire chair at this stopping point. Note the extra fabric pulled through the seats. a dust barrier (filter) and softening the seat ever so slightly. sloppy placement, and believe even laypersons (clients) will notice over time. 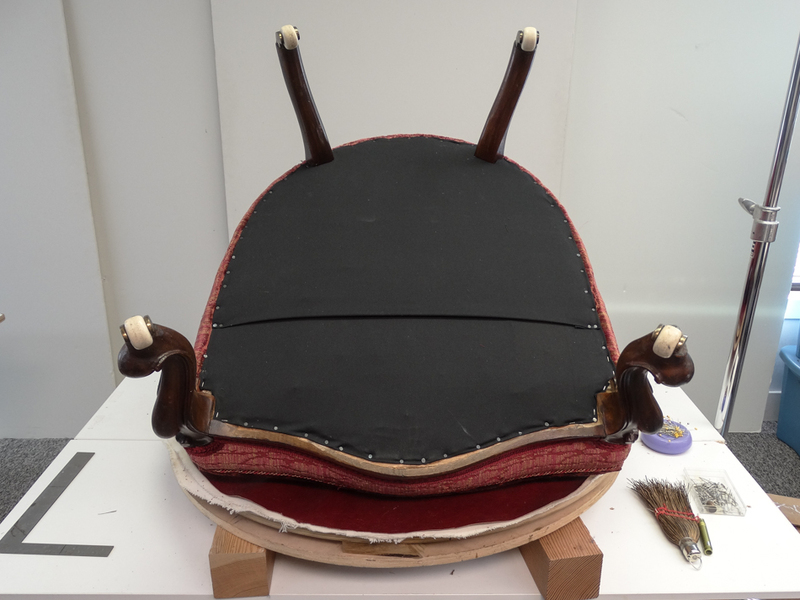 prior to padding and final upholstering of the showcover. 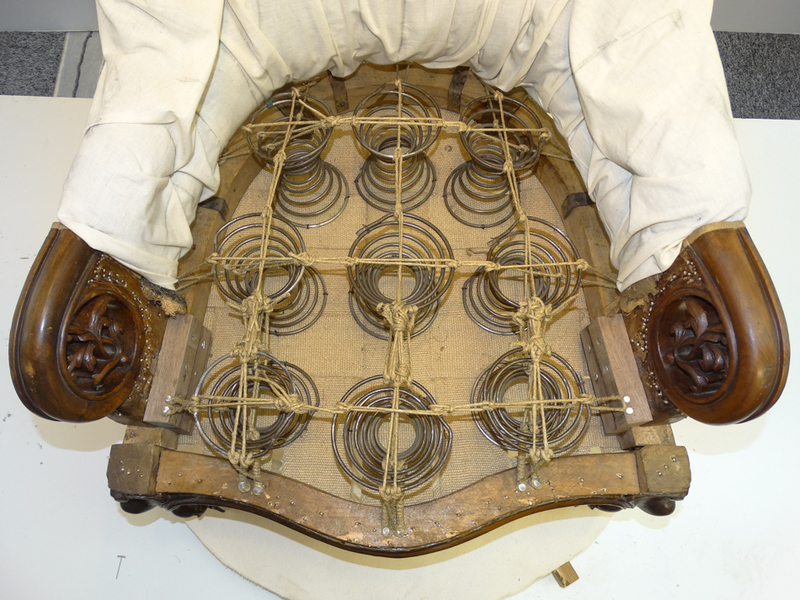 little rigid structure within… all hidden, all an important part of our upholstery heritage. and secured with a locking back stitch. The chair was turned upside down. A layer of organic 100% staple cotton batting was followed with 400 ct percale muslin, stretched, pinned, and blind-stitched to the foundational cloth. 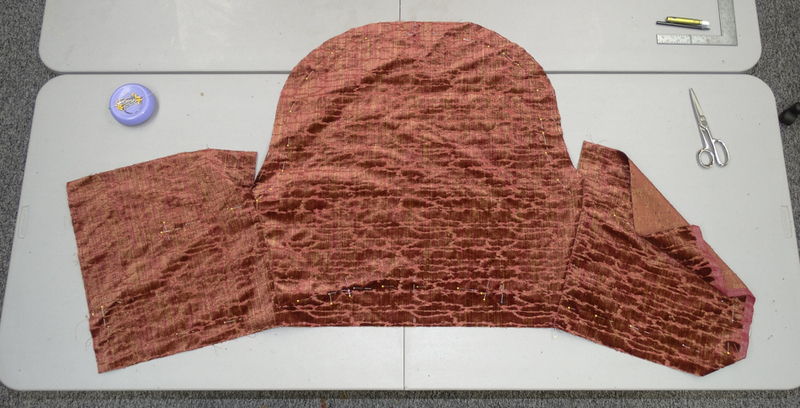 material was cut and machine stitched readied for application. of the decorative rope braid, and blind-stitched or tacked. using a good grade white tacking glue. Mitchell included a secret pocket beneath conserved pieces when possible. the piece can be stashed in a waterproof container. Remember the steel hoop listed to one side from a regular sitter favoring a position? Notice how the inside back asymmetrical contour lists above? This is due to the steel hoop listing. though they are level — it is an optical illusion due to the tilted frame. 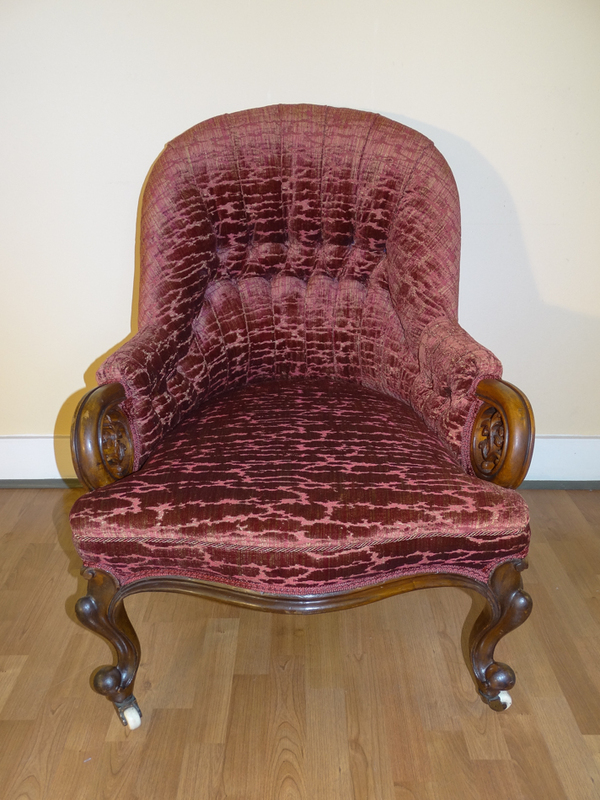 In person the chair rarely reveals the listing but the still shots reveal it! 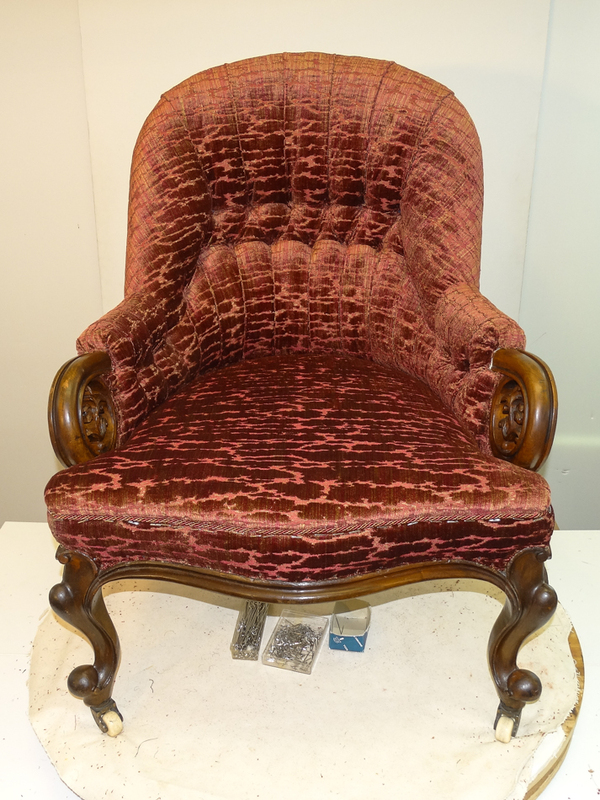 The Planter’s Chair completed in our studio! An overview of the process, from one vantage point, below. contact information to dkatiepowell at aol.com (remove space and insert @). It will be used by no one else for any other purpose.